I’m that Geek that Google flies around to speak about their own products, invites to present at their offices and lets test products and features before everybody else. I’m that Geek that makes you a quarter of a million dollars in 5 days. I’m that Geek that gets you 2,740 views in 3 minutes and over 30,000 in just 14 days. I’m that Geek that takes away your tech problems, and frees you to do what you do best. I’m that Geek that gets you $15,000 clients when you’re trying to sell your $3,000 course. I’m that Geek that gets 80% retention on an hour and a half hangout. (Indeed). I’m that Geek you want with you in front of the camera, and behind. I’m that Geek that chats with Tom Chi about creating Google Glass, with Former US ambassador to the UN, Sichan Siv, about his journey from the killing fields of Cambodia to the White House, with SVP of Digital Marketing @ The Walt Disney Studios, T.J. Marchetti about bringing the Muppets back, with the youngest NAACP president, Ben Jealous, about almost being killed for a story, with John Gray about his days as a celibate priest, his grand comeback to women and finally settling down with his wife, and in the same breath dives into Semantic Search with David Amerland, profiting from web shows with David Siteman Garland, Podcasting with John Lee Dumas, Systems with Natasha Vorompiova and gets hypnotized on a live hangout with Paul Ramsey. I’m that Geek that opens up the stage and lets you in to speak with these high calibers face to face. I’m that Geek that asks the questions no one dares to ask...but everybody wants to hear. I’m that Geek who reads your book, and gamifies it. I’m that Geek that gets frustrated when marketers talk about engagement but really don’t want to spend the time to talk to you. I’m that Geek you saw on DataMation, Diamonds in Your Backyard, Audience Hacker, Business Rockstars, Suitcase Entrepreneur, Female Entrepreneur association, Google TV, Google Developers, Entrepreneur on Fire, Rise to the Top, Lifestyle Academy, Social Good Summit, Global Game Changers, and on the stages of Eben Pagan - Accelerate, Metamind, Austin Entrepreneur Series, Google Business Groups, etc. I’m that Geek that showed a radio station how to professionally broadcast their shows on YouTube. I’m that Geek that finishes her Air Force training in Israel and takes a one way ticket to Chile, a backpack and a tent without speaking a word in Spanish. I’m that Geek that hitchhikes from Calafate to the Iguazu falls with Argentinian truck drivers (and lives to talk about it). I’m that Geek that bungee jumps of a bridge in Ecuador. Twice. I’m that Geek that says she can do it and then figures out how. I’m that Geek that worships Brene Browné and still struggles with vulnerability. I’m that Geek who believes your network is your networth. I’m that Geek that is allergic to Woo Woo talk and whose mission is to use technology to scale intimacy so we can discover what connected hearts and mind can achieve. I’m that Geek that will be as invested as you, if not more, in the growth of your business. I’m that Geek that connects the dots before you even notice they’re there. I’m that Geek that finds herself in a room full of Apple users, stands up and asks - what’s wrong with you people?!? I’m that Geek that loves testing new gadgets and tell you all about them. I’m that Geek that gets your buyers’ oxytocin flowing when they think of your brand. I’m that Geek who’s brain your want on your side. I’m that Geek who’ll try everything at least once (unless it’s pork. That’s a filthy animal). 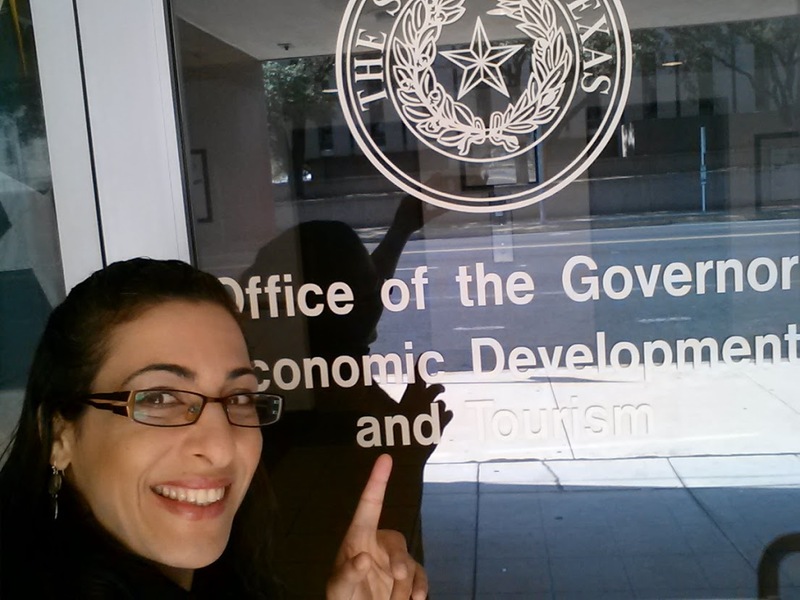 An Engagement Maven, Yifat Cohen is a visionary. A muse. The architect behind generating a quarter of a million dollar in just 10 days with hangouts. A Growth Hacker specializing in community building, gamifying live engagements and cultivating brand evangelists. She also loves speaking, strategizing and sharing her 4 min. solutions with anyone possessing a great sense of humor. 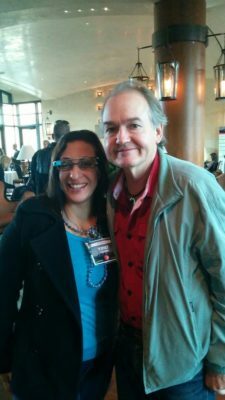 With John Gray, Best selling author - Men Are from Mars, Women Are from Venus. Listen, I’ll get right to the freakin’ point. 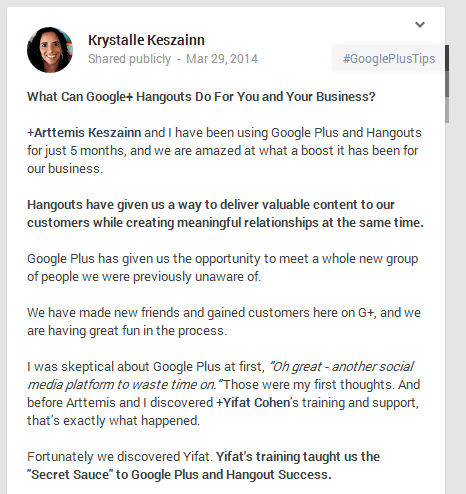 Before I met Yifat, I knew so little about Google+ hangouts that it was just sad. Since Yifat showed me (and my audience) the light, I’ve participated in my first Hangout (which was awesome) and I know my audience and customers have been hosting their own. 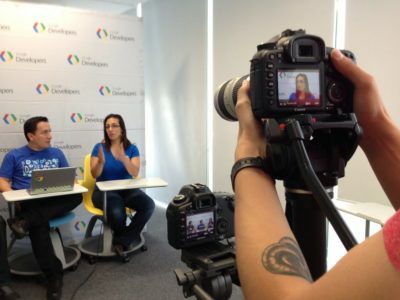 Yifat will help you dominate Hangouts as well. 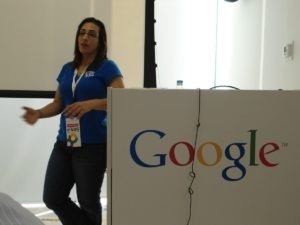 What Yifat doesn't know about Google+ isn't worth knowing. Want To Be ‘That Girl’ Online? 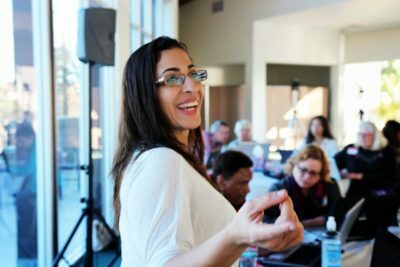 If you’re starting to get more serious about using Google+ to grow your business, check out this new course created by my friend Yifat Cohen the G+GoTo Gal. I just signed up and it is awesome so far! I've learned so much from Yifat and everything she creates is genius (plus, she overdelivers by about 1000% so you know this is going to be fantastic). 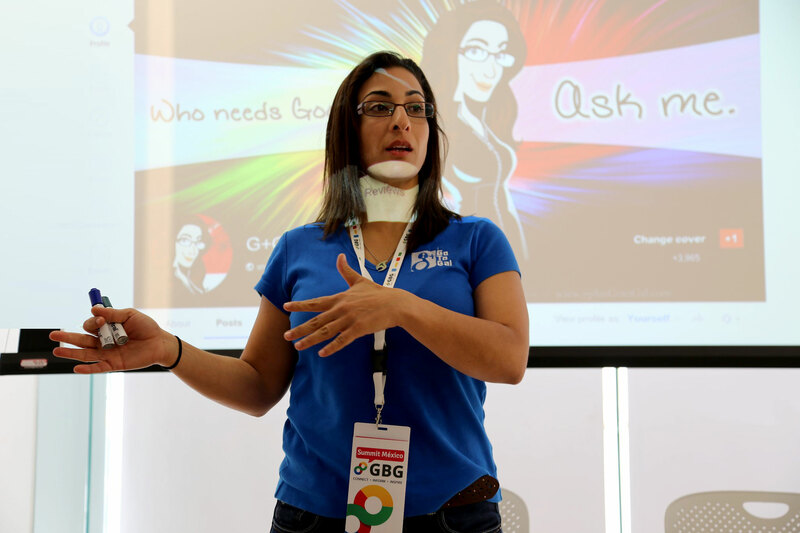 Google is leading the way in the online world, and Yifat is leading the way Google Plus. Until my hangout with Yifat, my understanding of G+ was close to zero. By the time our hangout was done, I truly realized how much opportunity I was leaving on the table by not operating my G+ account the way it should be. 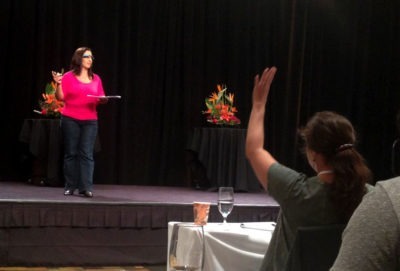 Thank you Yifat for taking EntrepreneurOnFire's G+ from the dark woods of ignorance to the beautiful fields of opportunity. 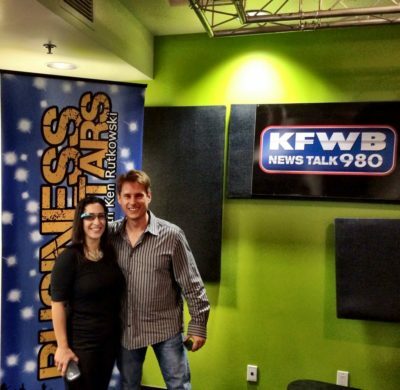 Turning your raving fans into high end clients. 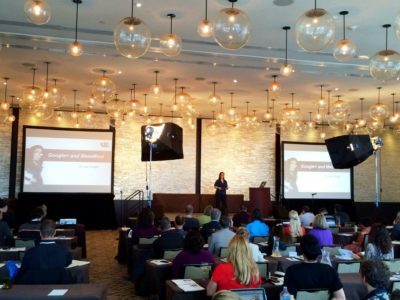 Go Viral - Turning your raving fans into high end clients.